This itinerary provides the perfect combination of the most popular places for the summer season. Do not miss a chance to visit Mt. Fuji 5th station, which is accessible only during summer. Enjoy Yamanashi prefecture local cuisine 'Hoto hotpot' at lunch time, near lake Kawaguchi. This tour will then take you to Mt. Fuji Panoramic Ropeway where you will take an 8 minute ride to the observatory and be able to see a picturesque view of Mt. Fuji. Once back from the ropeway, you will visit a farm to try fresh fruits. Enjoy the seasonal fruits as much as you wish. The last destination is Chateau Katsunuma winery. Yamanashi prefecture is well known for good wine. Try some and find your favorite bottle on this day trip. The tour will start from either “Hotel Gracery Shinjuku” or “Shinjuku Washington Hotel”. The tour will first head to Mt. Fuji 5th station, where the tour bus will drive up to 2300 meters above the sea level by Subaru Line. You will be amazed by the breathtaking panoramic views from the observatory. Not only will you see the grand view of the foot of the mountain, but you will also be able to see the majestic Mt Fuji. Appreciate the beauty as you take a 50-minute walk around the area. Next, you will head to a restaurant near Lake Kawaguchi. The Yamanashi specialty 'Hoto Hot Pot' noodles and fried chicken will be served for lunch. (*No beef or pork. Vegetarian meal is also available if requested at least 5 days in advance.) Enjoy the local food and if you finish lunch early, stroll around the area until the bus departs. The tour will then head to the Mt. Fuji Panoramic Ropeway, where you will take a short ride to the observatory, which is perfectly located to see a full view of Mt. Fuji. You will have around 20 minutes at the observatory. Do not miss the chance to take photos of the mountain. 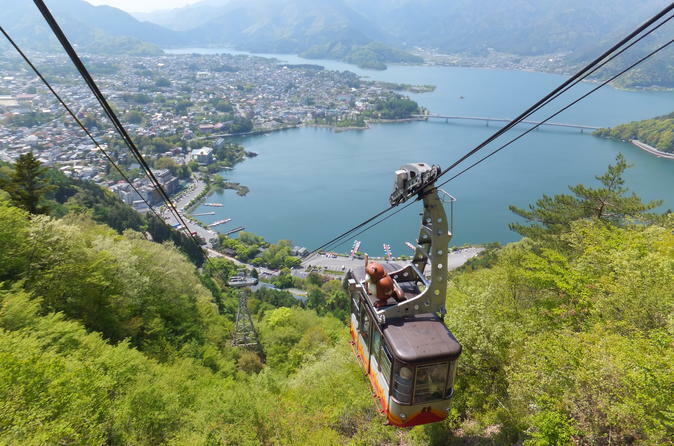 You will take the ropeway on the way back to the bus park as well. The final destination is Chateau Katsunuma winery in Yamanashi prefecture. This area is the perfect representative of good wine production as they harvest high-quality grapes. Try some Japanese wine, as the shop will offer you wine tasting. Find your favorite bottles to buy and bring back, before heading back to Shinjuku. The approximate arrival time is around 18:20.